Even though he hosted a fundraiser for Democrat Hillary Clinton earlier this week, singer Jon Bon Jovi said Republican presidential candidate and New Jersey Gov. Chris Christie is free to use his music at campaign events, Politico reported. 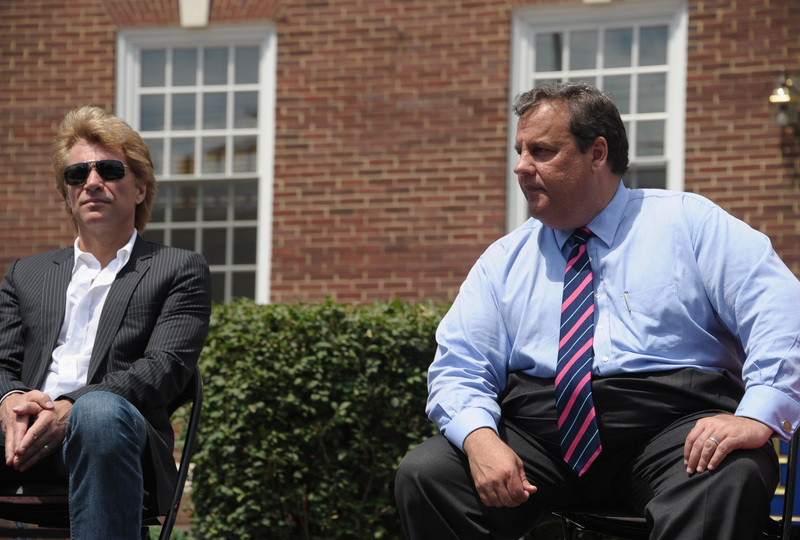 The two men, both New Jersey natives, are apparently friends, which for Bon Jovi is not related to party affiliation. "My friendships are apolitical, and yes, I absolutely gave him permission to use my songs," Bon Jovi said via his publicist. Back in 2013, Bon Jovi donated $1 million to the New Jersey Hurricane Sandy Relief Fund, a charity set up to help victims of the storm that ravaged New Jersey in October 2012 The fund was overseen by Christie's wife, Mary Pat. Christie, who announced his candidacy for governor on Tuesday at the high school he attended in Livingston, New Jersey, played the Bon Jovi song "Who Says You Can't Go Home" at the kickoff event. A check of the lyrics suggests that song was well-suited for the occasion: "Who says you can't go back, been all around the world and as a matter of fact / There's only one place left I want to go, who says you can't go home." There are a few other songs in the Bon Jovi repertoire that Christie might put to good use during his presidential run. Of course, there are also one or two he might want to avoid. First, watch this video and bask in the wonder that is Jon Bon Jovi's 80s hair. Of all his songs, this one might be the best fit for Christie as he attempts to connect with voters and convince him he is in their corner, always. Consider these lyrics: "I'll be there for you / These five words I swear to you / When you breathe I want to be the air for you." What voter could resist a politician so clearly devoted? Although it is the most recognizable of Bon Jovi's songs, Christie is already facing an uphill battle in a very crowded field of Republican contenders. To suggest his campaign is hanging on by a thread or living on a prayer won't instill confidence in undecided voters. When Bon Jovi sings "We've gotta hold on to what we've got / It doesn't make a difference if we make it or not" it has a little too much desperation for a presidential contender. Now here is a song that should definitely be on the Christie campaign playlist, especially if he wants to stick with this rough and tumble underdog image that he seems to like so much. "We weren't born to follow / Come on and get up off your knees / We weren't born to follow / You gotta stand up for what you believe." He might even want to think about putting that on Christie 2016 t-shirts. Even though this song talks about people who stood their ground and never backed down, with Christie's reputation for incendiary comments and quick temper, it might turn off voters to associate him with these lyrics: "It's my life / And it's now or never / I ain't gonna live forever / I just want to live while I'm alive." Although, it might make Christie seem edgy. Tough call. Jon Bon Jovi, who knew you were so deep and complex! This is another one that could go either way, depending on what audience Christie is playing to, or what point he's at in the campaign. "Gonna take a miracle top save us this time / And your savior has just left town / Gonna need a miracle 'cause it's all on the line / And I won't let you down." If Christie's running neck and neck with, say, Jeb Bush, this song might do the trick, especially if he's seeking campaign contributions. But it might not play well with the religious crowd to suggest his campaign needs divine intervention.